The New Austrian Tunneling method (NATM) was developed between 1957 and 1965 in Austria. It was given its name in Salzburg in 1962 to distinguish it from old Austrian tunnelling approach. The main contributors to the development of NATM were Ladislaus von Rabcewicz, Leopold Müller and Franz Pacher. 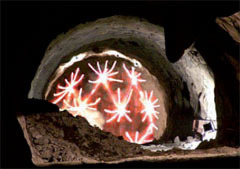 The main idea is to use the geological stress of the surrounding rock mass to stabilize the tunnel itself. 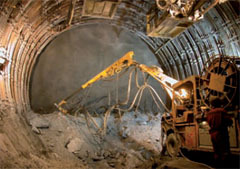 The NATM integrates the principles of the behaviour of rock masses under load and monitoring the performance of underground construction during construction. 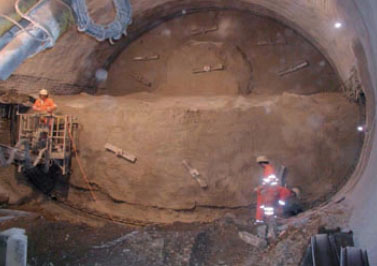 The NATM is not a set of specific excavation and support techniques and has often been referred to as a “design as you go” approach to tunnelling providing an optimized support based on observed ground conditions but more correctly it is a “design as you monitor” approach based on observed convergence and divergence in the lining as well as prevailing rock conditions. 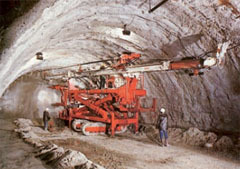 Mobilization of the strength of rock mass – The method relies on the inherent strength of the surrounding rock mass being conserved as the main component of tunnel support. Primary support is directed to enable the rock to support itself. 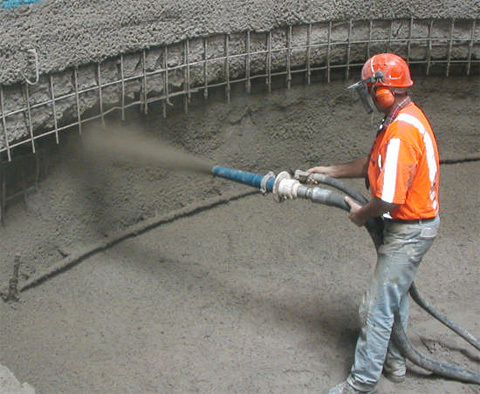 Shotcrete protection – Loosening and excessive rock deformation must be minimised. 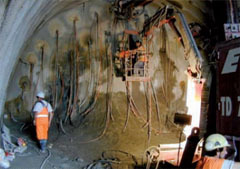 This is achieved by applying a thin layer of shotcrete immediately after face advance. 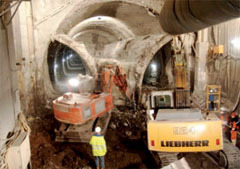 Measurements – Every deformation of the excavation must be measured. NATM requires installation of sophisticated measurement instrumentation. It is embedded in lining, ground, and boreholes. Flexible support – The primary lining is thin and reflects recent strata conditions. 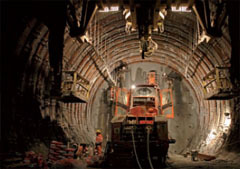 Active rather than passive support is used and the tunnel is strengthened not by a thicker concrete lining but by a flexible combination of rock bolts, wire mesh and steel ribs. Closing of invert – Quickly closing the invert and creating a load-bearing ring is important. 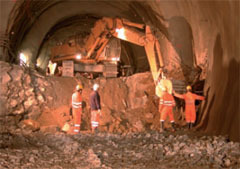 It is crucial in soft ground tunnels where no section of the tunnel should be left open even temporarily. Contractual arrangements – Since the NATM is based on monitoring measurements, changes in support and construction method are possible. This is possible only if the contractual system enables those changes. Rock mass classification determines support measures – There are several main rock classes for tunnels and corresponding support systems for each. These serve as the guidelines for tunnel reinforcement. Based on the computation of the optimal cross section, just a thin shotcrete protection is necessary. It is applied immediately behind the Tunnel boring machine, to create a natural load-bearing ring and therefore to minimize the rock’s deformation. Additionally, geotechnical instruments are installed to measure the later deformation of excavation. Therefore a monitoring of the stress distribution within the rock is possible. This monitoring makes the method very flexible, even at surprising changes of the geomechanical rock consistency during the tunneling work, e.g. by crevices or pit water. Such (usual) problems are not solved by thicker shotcrete, but the reinforcement is done by wired concrete which can be combined with steel ribs or lug bolts. 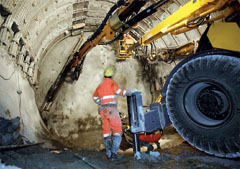 The measured rock properties lead to the appropriate tools for tunnel strengthening. 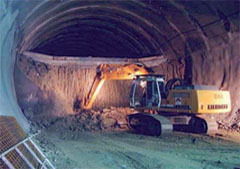 Therefore in the last decade NATM was also applied to soft ground excavations and to tunnels in porous sediments. The flexible NATM technique enables immediate adjustments in the construction details, but this requires a flexible contractual system, too. 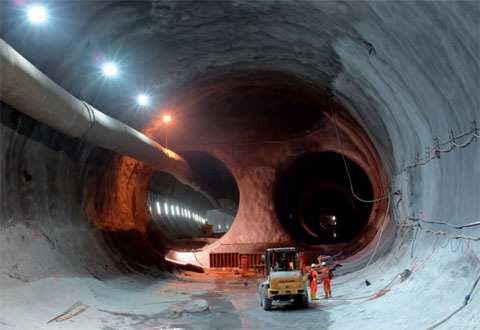 The strength of the ground around a tunnel is deliberately mobilized to the maximum extent possible. Mobilization of ground strength is achieved by allowing controlled deformation of the ground. Initial primary support is installed having load-deformation characteristics appropriate to the ground conditions, and installation is timed with respect to ground deformations. Instrumentation is installed to monitor deformations in the initial support system, as well as to form the basis of varying the initial support design and the sequence of excavation. The tunnel is sequentially excavated and supported, and the excavation sequences can be varied. The initial ground support is provided by shotcrete in combination with fibre or welded-wire fabric reinforcement, steel arches (usually lattice girders), and sometimes ground reinforcement (e.g. soil nails, spiling). The permanent support is usually (but not always) a cast-in-place concrete lining. Some experts note that many of these construction methods were used in the US and elsewhere in soft-ground applications, before NATM was described in the literature. Flexible – Support provide as required by the ground conditions . Safe – Able to deal with locally unexpected ground condition, minimizing claims. worst load case – if needed or not, therefore overdesigned. Adaptable – Optimizing equipment and crews, allowing multiple heading operations concurrent. High level of coordination, cooperation and communication. Interruptions in excavation and support works have to be avoided as much as possible. 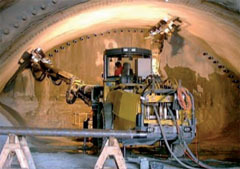 Tunnel Lining – Sprayed Concrete. Typical Performance – 1m to 3m per day. 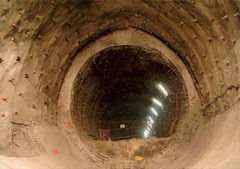 Actual performance and costs will depend on ground conditions and tunnel diameter.